Werz Saltbaron (from Gracklstugh), commissioned the delivery of raw spell gems to Kazook Pickshine. He is an alchemist who can be found in Blingdenstone market, the trader’s grotto (page 103). He pays them with a zircon worth 50 gp. Pelek’s ghost (from the Whorlstone Tunnels) asked the PC’s to bring his remains (just his hand) to Blingdenstone. The hand can be delivered to Burrow Warden Jadger in the catacombs in The ruby in the rough (page 103). When the party arrives to Blingdenstone they will be level 6, and way more prepared to deal with threats than they were before. Fortunately, unless they mess it up at the city’s entrance, they will be received warmly by the deep gnomes, even the innkeeper will lodge them for free just for the novelty of having strangers around. The city has seen better days and it’s been a year since the Diggermattocks (the couple in charge) came back to the city with an expeditionary force to reclaim it. They are still cleaning and reopening areas of the city as it is needed. Since word has spread that the city is again under gnome control, deep gnomes from all over the underdark are slowly returning to their ancient home. The city has two main problems right now: the first is the community of wererat gnomes, who are loathed by some of the regular population; the second problem is reopening some city areas which are too dangerous for the gnomes to clean (specifically the Rockblight, page 107, and the pudding court, page 111). Parley or exterminate the wererats. Dorbo wants to kill them all while his wife Senni wants to make peace. Great opportunity for roleplay here. Have the players join in on the genocide vs equality talk. Clean the Rockblight by destroying the rock monsters, the medusa and Ogremoch’s Bane. Gurnik Tappfinger will ask the PC’s to cleanse the temple Steadfast Stone, which is inside the Rockblight (page 109). In reward he will give them a blessing of protection or a Blissing of weapon. The more side-quests they complete, the more acceptance and support they will receive from the deep gnomes. The intention is for the PC’s to become the city’s heroes. This is the first major quest in the city, to clean the Rockblight. The place is home to Ogremoch’s Bane, an extraplanar entity who has been in the city for decades. It’s harmless to living beings, but its influence is highly corruptive to earth elemental creatures, it possesses them. Deep gnomes rely on their earth elementals to repair the city. Except in this area, that is the reason why it’s still closed. At the end of this part of the adventure, the PC’s will come face to face with Ogremoch’s Bane. Most likely there will be nothing they can do against it. A Banishment spell is needed to make the entity go away. Still, the PC’s help in getting rid of the elemental creatures and the medusa is very valuable. Clearing up Steadfast Stone is also important since it opens up an alternative way into the pudding court. There is a possibility that one or more PC’s are turned to stone by the medusa. If this happens, Nomi Pathshutter can mention the fact that Entemoch’s Boon (page 100) had been reported to be the lair of some basilisks, whose stomach juices can be collected and given to Kazook Pickshine. He can prepare a balm that restores petrified characters to life. If the party is lacking some heroes, this is the perfect chance for Mev Flintknapper to repay the favor, he and Sark Axebarrel can join the party temporarily (and be controlled by the players) to go basilisk hunting. The wererats’ leader Chipgrin Goldwhisker, turns out to be a very talkative gnome. He reveals the fact that the wererats have been talking the bad part of the ooze infestation, unfortunately they are close to moving away from the city, unless an arrangement is made with Dorbo, for the good of the city. The PC’s will have a chance to go and see how messed up the ooze infestation is. Chipgrin will pressure for a meeting with the Diggermatocks. The first thing to be decided before the battle is the relationship between the gnomes and the wererats. This is were different D&D groups can have very different outcomes. It could end in genocide, or the wererats moving out of the city, or a peace treaty for the good of everyone. Even with a truce, depending on the negotiations and PC’s attitudes, the peace could be short lived, resolving in open warfare after the ooze problem, or even, an open betrayal during the battle (by Dorbo or Chipgrin). This is a great roleplaying opportunity for the RP heavy groups. These peace talks have the potential to last for hours in real time. If roleplaying is important in your game, remember to have other citizens of the city touch the subject from time to time during the party’s stay in the city. The city is divided in this subject, some hate the wererats like Dorbo, some accept them as deep gnomes and would like peace like Senni, and some don’t care. The PC’s must have in mind that there is not a majority of opinion. It will be on them how they direct the negotiations. Something to be take into account is that the wererats are stronger than regular deep gnomes, this makes them a great addition for the battle. Without their help, or if there is a betrayal, the battle will become more deadly. The book presents a list of things to do to prepare for the battle, two of the options require the party to travel to Neverlight Grove and Gracklstugh. These options are here just in case Blingdenstone was visited before those places. If the party has already been there, skip these options. Page 114 lists the benefits of doing what is needed for the battle, if everything is done, the party will have a big advantage in the battles to come. Once everything is done, the battle begins, the strategy is to send a big chunk of the army from one end as a distraction, while the shock team (the PC’s) blitzkriegs their way up to the pudding king. Decide in advance the number of fights that will happen before the PC’s fight the pudding king. 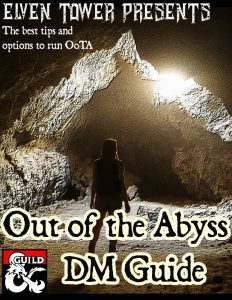 The encounters suggested in page 114 are very soft, if you take into account the boosts that the party has like acid resistant weapons, the blessings and Jadger’s help. 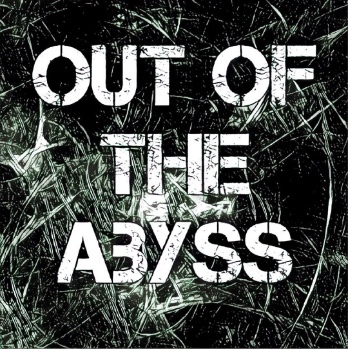 Beef up these encounters with 2 or 3 extra oozes to make the party spend some resources. The Pudding king in the book is too weak for a boosted up level 6 party. He should not fight alone, have his royal oozes (Prince Livid and Princess Ebonmire, page 111) with him at all time and some extra oozes to help. This should be a tough fight, the highlight of the night. When he dies his last words are a foreshadowing of Juiblex and Zuggtmoy encounter in chapter 16, The fetid wedding, but the PC’s won’t know that yet. 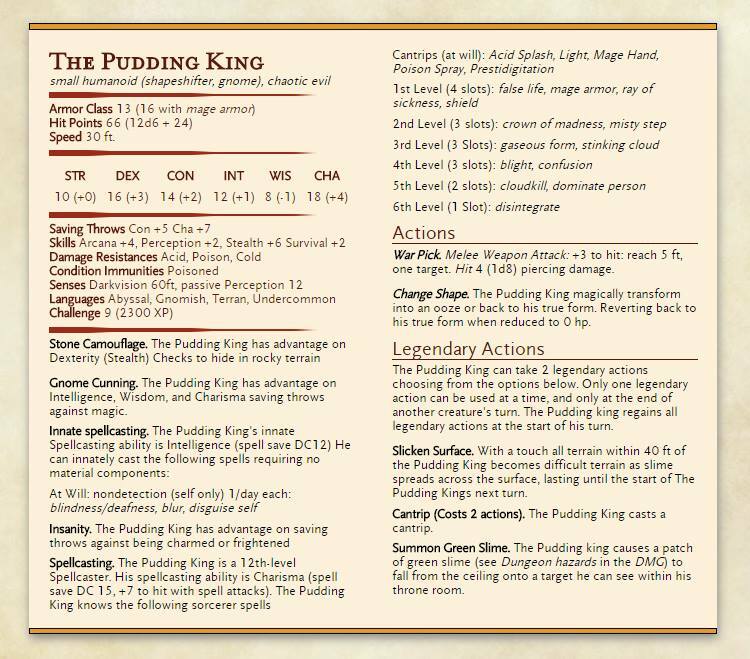 Here’s an alternate Pudding King that can offer more of a challenge. It should be a tough fight. Have him cast disintegrate as soon as a PC gets there, follow up with cloudkill and then blight or dominate person. All this while his ooze puppets try to shield him from enemy attacks. After freeing the city from the Pudding King, there is still a lot to do, since the rest of the oozes are there, but know there is not a mind behind them. The party are local heroes now. The gnomes of Blingdenstone thank them and they are forever welcomed to the city. Dorbo Diggermattock will now help them go back to the surface. However the DM desires this can be done (tunnel, portal, teleportation), Dorbo will provide help in the form of maps or gnome guides to accompany the party back to the surface. If the sentient gelatinous cube is with the party when they come to Blingdenstone, he can’t enter the city as the deep gnomes have their own war against oozes. So Glabbagool will leave them to find a different way in. He manages to find the place the rest of the oozes are using to enter the city and spends some time with the oozes and the Pudding King. Due to his sentience, he is immune to the pudding king’s control. Later on he can find the party in the Rockblight or wherever there are no gnomes around to give them extra information about the situation in the upper city or the whereabouts of the king. After explaining to the gnomes of the strange nature of Glabbagool he can be nervously allowed inside the city. He can be a great help in the battle since other oozes won’t attack it. After the battle, Glabbagool can decide to stay in the city to help them rebuild it. He is oddly accepted as part of the city after everybody sees him help in the fight against the Pudding King. Great write-up. My party is approaching Blingdenstone and you’ve given me plenty to work with. I feel like I want to give a gnomes a slightly mad-hatter feel given that this is the city where the inhabitants are not outright suffering from the madness. A mad-hatter attitude might just be what they need ! Hahaha, great idea. Glad you liked the article, tonight I’m writing the next chapter. Sentient gelatious cube. That is genius. Wouldn’t a disintegrate spell be catastrophic for the party at level 6? I dont think any party members would survive ~75 points of damage into instant death, if they failed the save. It’s a suggestion, the party has access to counterspell too. This battle can end really quickly if the pudding king isn’t buffed.